This popular knock down (K.D.) kit, a long-time favorite of contractors and as an add-on to the screen repair section of hardware stores, is now available for open purchase at a great price! This is a sturdy, durable, Extruded Aluminum patio screen door kit that works well in most residential environments. All necessary hardware is included, including steel corners and adjustable steel wheel assemblies. The units are pre-mitred, notched and drilled for fast and easy assembly. The units do not include screening or spline which are readily available at your local hardware store. Choose from 30 1/2 ", 36 1/2" or 48 1/2" inch standard width sizes (Door height is 80 1/2"). K.D. height can be mitre-cut to fit as needed. Contractors, our K.D. sliding screen doors are designed to appeal to your customers quality and budget requirements. They can be sold as is for customer assembly or have your screen repair pros do it. Screen and spline are not included with the contractor's units (use with 0.165 inch spline). NOTE: Custom sizes are not available with these patio door screen units. 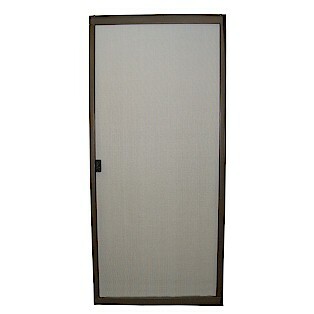 The STANDARD sliding screen door comes in three width options 30 1/2" , 36 1/2" AND 48 1/2" inches. For wider doors see the Heavy Duty sliding screen door.